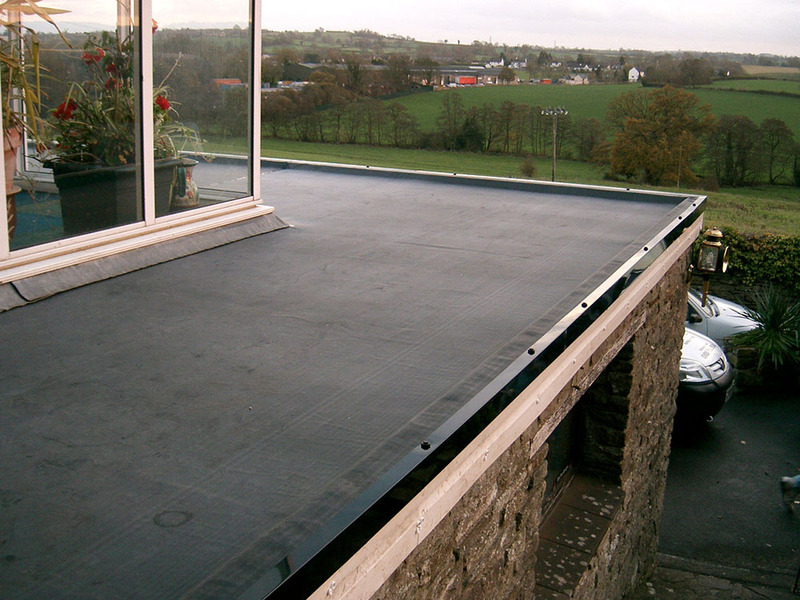 We are able to provide excellent, long lasting, flat roofing solution using top quality, long lasting EPDM single-ply membrane. 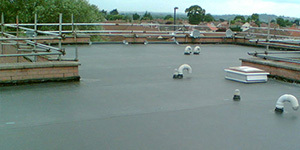 As with many countries across the world we have traditionally covered our flat roofs with bituminous felt, and due to the unreliable nature of bituminous felt we have to regularly keep recovering our flat roofs. 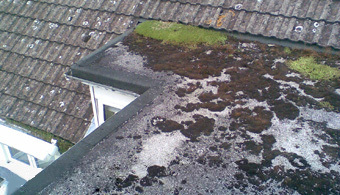 As we all know felt roofs can have a very limited life span. Well, we don’t have to do this any more! 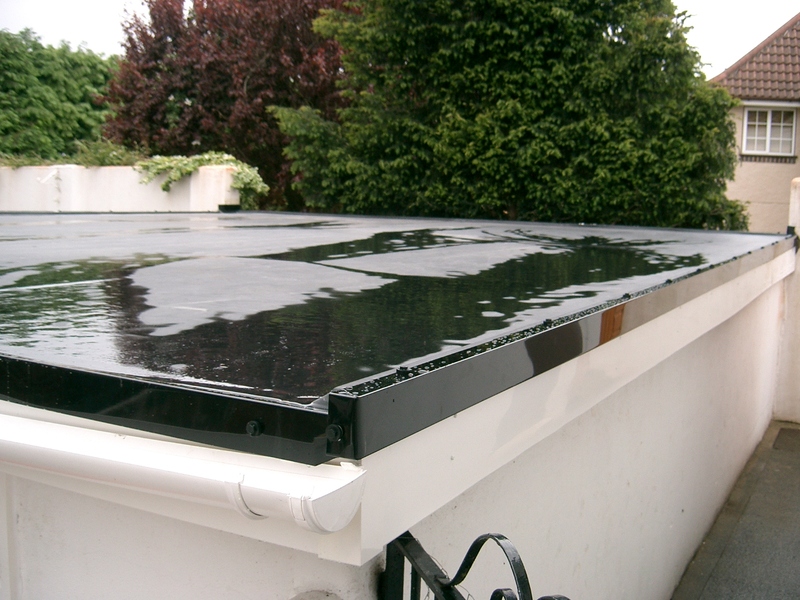 Install an EPDM rubber roof covering and never have to re-cover it again! Over a billion square metres have been installed worldwide over the past 50 years. 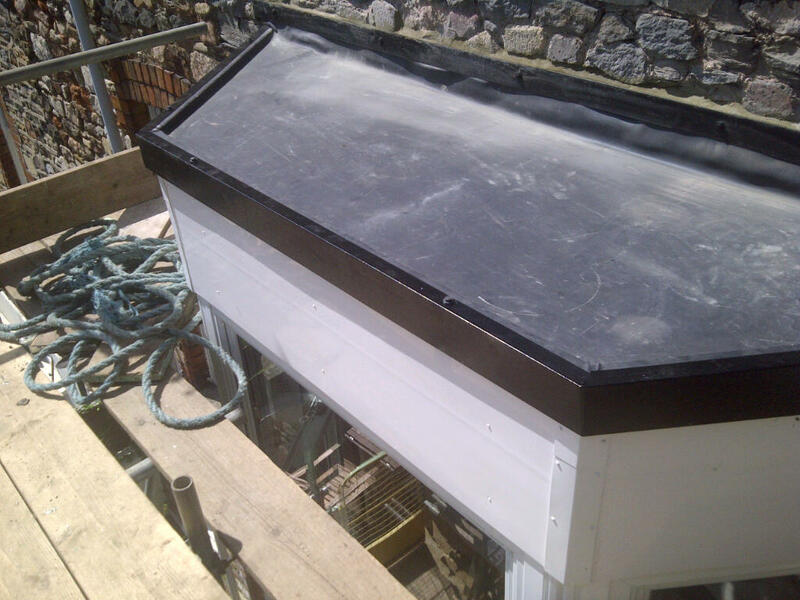 Aquagard Roofing Solutions are able to provide a durable, long-lasting flat roofing solution using high-quality EPDM single-ply membrane. EPDM (ethylene propylene diene monomer) is a synthetic rubber used in many applications particularly waterproofing worldwide. 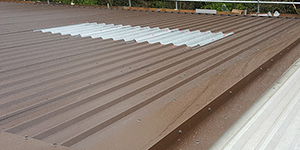 Due to it’s flexibility and durability in membrane form it provides an extremely durable and long lasting flat roof covering which remains unaffected by temperature variations of exteme heat and exteme cold. 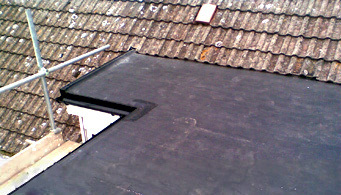 Many residential roof areas can be covered using a single sheet removing the need to join the membrane on site. Where this is unavoidable the two pieces are chemically seamed together to create one piece without the need for heat or naked flames. They are NOT glued together and so cannot leak through joins in the future. 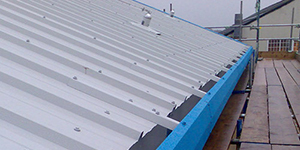 Aquagard Roofing Solutions will carry out a full survey of your existing roof area prior to providing a written specification and quotation for the necessary works. 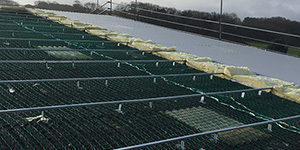 This will include renewal of roof decking if necessary and the incorporation of insulation if necessary or required. 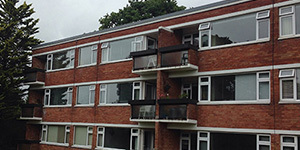 We can also include for anciliary items such as the renewal of fascia’s, gutters, rainwater pipes and balcony coverings such as tiles or timber decking. certificate will be issued on completion along with an insurance backed guarantee. 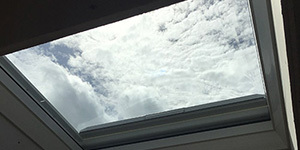 If you are experiencing water ingress or damp from your flat roof whether it be an extension, a bedroom dormer, a porch, a garage or any other flat roofed area of your home we are ready to take your call and offer free and informed advice and quotations. For your added peace of mind Aquagard Roofing Solutions have been in business for over 15-years and are members of the National Federation of Roofing Contractors, are Government endorsed TrustMark Contractors, members of the Competent Roofer scheme and are Trading Standards Approved. Domestic residence in Monmouth, South Wales: Our works consisted of the removal of existing concrete paving and roof covering back to a smooth concrete surface. 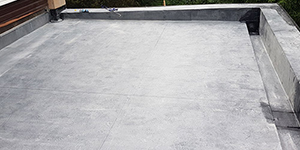 Rigid polyurethane insulation was then adhered to the concrete surface to help reduce heat loss during the winter and heat gain during the summer with EPDM flat roof single-ply membrane installed over providing the owner with a 20-year warranty. 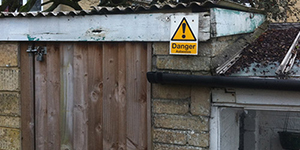 Garage in Bristol: Our works consisted of the removal of existing roof coverings and chipboard decking. New 18mm thick exterior structural grade plywood was then installed followed by RubberBond Fleeceback EPDM single-ply membrane. 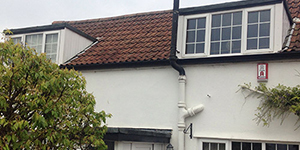 Our works also included the renewal of fasica boards, gutter and rainwater pipe all covered by a 20-year warranty. 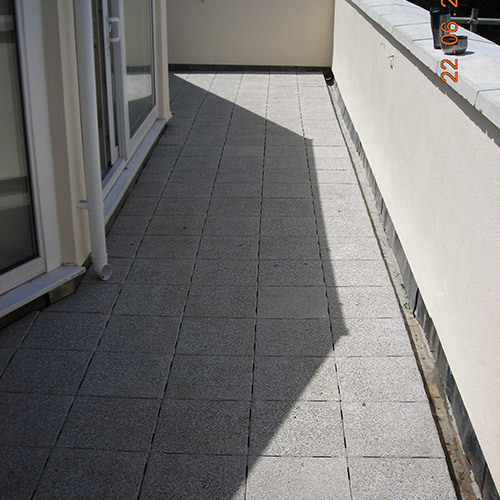 Roof areas that are to be used as balconies require a suitable surface to allow this. 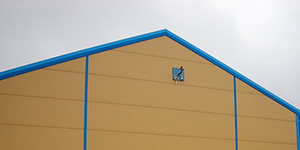 AquaGard Roofing Solutions can provide a range of surface finishes to suit most applications and tastes. 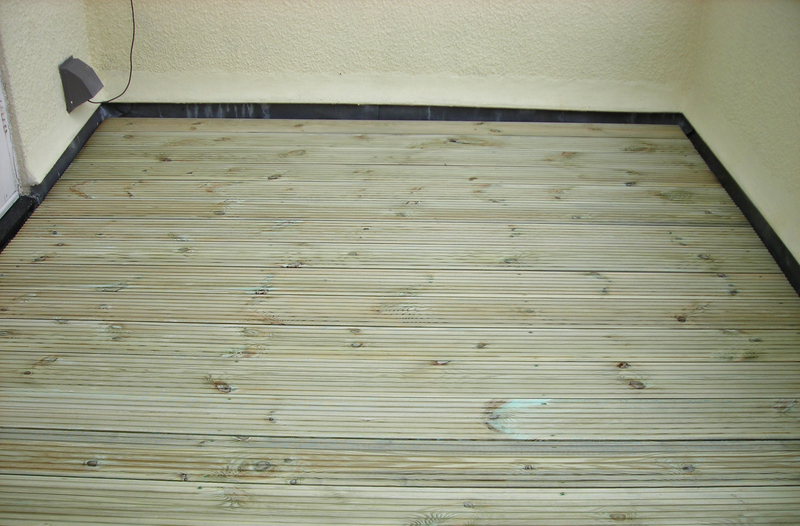 Timber decking can also be installed above the new roof covering. This again allows effective roof drainage below, eliminating ponding water and providing a modern aesthetically pleasing all-weather surface. Textured concrete paving installed over raised support pads allows rainwater to effectively drain between and under each paver eliminating ponding water providing a durable, all-weather surface. 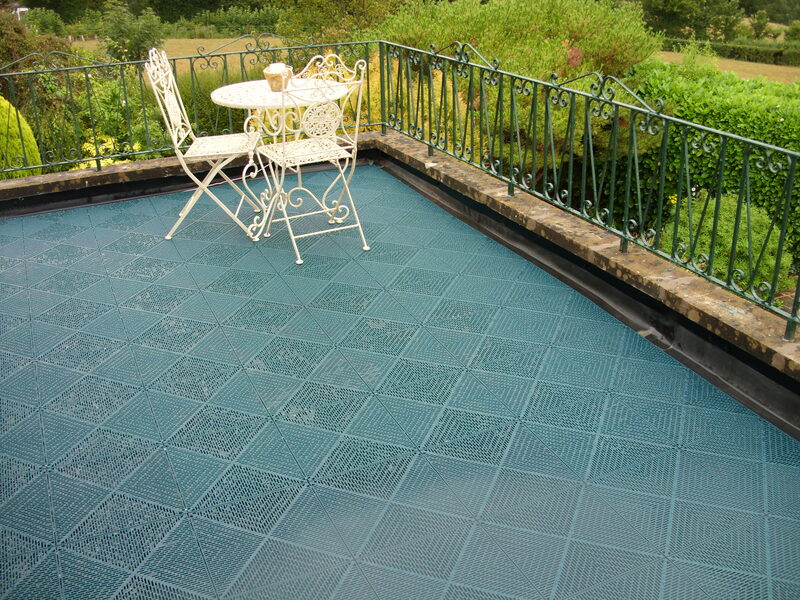 Glass reinforced cement (GRC) tiles can be bonded to the roof surface to provide a durable non-slip hard surface. 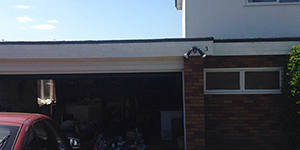 Protect your car or bike from the elements with a brand new garage roof. 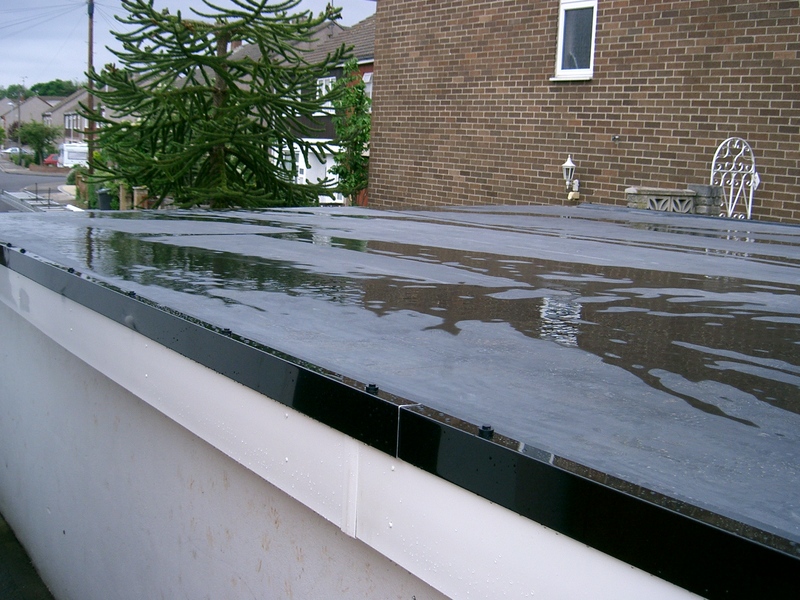 Revolutionary EPDM flat roof membrane roofing that's designed to last. 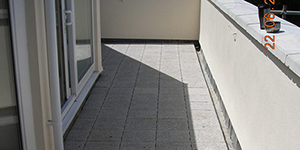 Make the most of your flat roof space with a roof terrace or balcony from AquaGard Roofing Solutions.